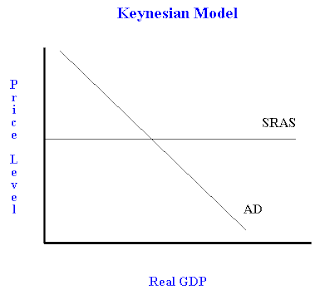 Introduction of the Keynesian short-run aggregate supply curve. - FreeEconHelp.com, Learning Economics... Solved! Home aggregate supply and demand keynesian macroeconomics Introduction of the Keynesian short-run aggregate supply curve. 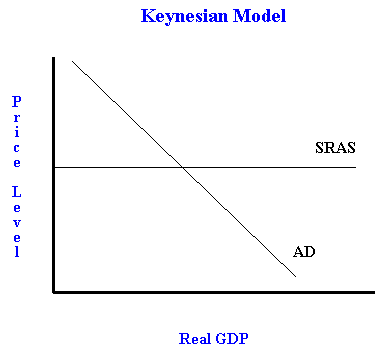 Introduction of the Keynesian short-run aggregate supply curve. Classical economists assumed that all resources present in the economy were being used at capacity. However, this theory was a complete contradiction to the actual economy during the world depression that started in the 1930’s where unemployment was rampant and factories were idle. John Maynard Keynes argued that prices and wages were sticky, in particular they were inflexible downward due to the existence of unions and contracts between employers and employees. He argued that in a world of excess capacity, an increase in aggregate demand will not impact prices (as the classical economists thought) but will instead impact real GDP. The assumptions of the Keynesian model are the same as the classical model except for two important differences: prices and wages are sticky, and excess capacity exists in the economy. 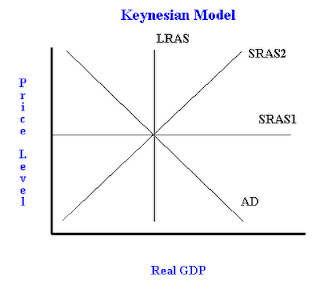 Within the Keynesian framework, the aggregate supply (AS) curve is drawn horizontally. This is done because prices are sticky in the short run, represented by the flat line (prices don’t change). Because this only occurs in the very short run, we label this the short run aggregate supply curve (SRAS). 1) Shifts from Uncounted production to Counted Production. Eg. Janitors now make stuff (counted) instead of cleaning stuff (uncounted). Remember that GDP counts the final value of a good or service produced, so if a janitor cleans a machine, the value of the service is included in the final value of the item made by that machine. By allowing the janitor to use the machine to make more stuff, real GDP will rise. 2) Existing capital is used more intensively; a factory can run 24 hours a day instead of just 8 hours a day. Other forms of capital can also be used more intensively so that real GDP will rise. 3) If prices are higher, the unemployed are more likely to accept jobs, and homemakers, younger and older people are more likely to enter the workforce. This results in an increase in the amount of labor in the economy which increases production and thus real GDP. Finally, new Keynesians realized that prices and wages were not perfectly sticky, even in the short run. Because of this they developed a new SRAS curve which was upward sloping. This allowed for some price and wage stickiness, but also allowed for some flexibility. This upward sloping SRAS supply curve has become the standard SRAS curve used in economic analysis. You may also see charts that show two SRAS curves, one horizontal, and one upward sloping. Generally the horizontal curve shows the very short run, and the upward sloping shows the short to medium run aggregate supply curve. In the long run, we end up back with the classical model, so the three different aggregate supply curves show us how prices and real GDP will change over short, medium, and long time frames.